Who was Jules Henri Poincaré? Jules Henri Poincaré (1854–1912) was a mathematician, physicist, and philosopher of science. He responded to the discovery of non-Euclidian geometry by suggesting a modification of Immanuel Kant’s (1724–1804) claim that we have synthetic a priori knowledge of the world (that is, certainly true knowledge that applies to reality, which is not based on experience). His proposal was what became known as “conventionalism,” namely that physicists will retain Euclidian geometry because it has the simplest geometrical conventions and is therefore appropriate for them. This proposal was short-lived in mathematics, because Albert Einstein was to show in his General Theory of Relativity that the curvature of space obeyed the principles of non-Euclidian geometry. However, the broader principle of conventionalism, namely that truth in science depends on agreement about specified rules, was to be revived as an idea of scientific truth in the twentieth century. A Venn diagram of sets A, B, and C. Where one or more sets overlap, it means that they have members in common. 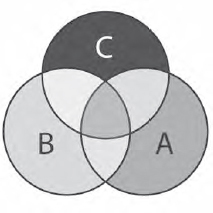 It can be seen by the overlapping in this diagram that some things are A, B, and C, some things are A and B, some things are B and C, and some things are A and C.